One of the most common questions I get from people looking to buy orgonite, is whether they need to do anything in order to activate or charge it. The short answer to that is no, it’s not necessary. The orgonite will work regardless. But, like crystals, orgonite has a form of consciousness, and is responsive to our energy and intentions. When I have a new orgonite that I’m going to use, I like to do the following meditation. It’s quick and simple! (for more ideas, check out The Power of Affirmations by Louise Stapely, which contains 1000 affirmations in different categories). Find a place where you can be undisturbed for 5-10 minutes, and get comfortable. Sit down and hold the orgonite in your hands. First of all, you’ll want to clear your mind. I like to do this by counting down from ten to one, while visualising myself descending stairs, sinking deeper into my body for each step. Breathe deeply and calmly. 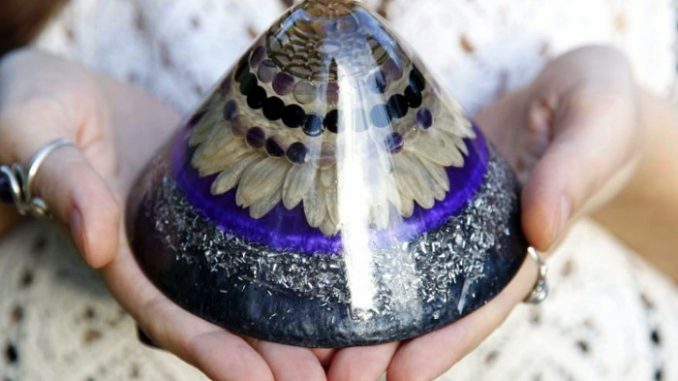 When you are in the right headspace, start connecting with the orgonite with your breath. We can manipulate the flow of energy by using our breath along with visualisation. On the inhalation: feel yourself drawing the energy of the orgonite in through your palms, up through your arms and into your body. On the exhalation: feel yourself gently pushing your own energy into the orgonite. Feel the energy flow start from your solar plexus area, travelling up your torso, through your arms and being emitted from your palms into the orgonite. Continue with this for as long as you want, but preferably for a minimum of 2-3 minutes. Don’t worry if you can’t feel it yet, or if it feels like you’re just imagining things in your head – it takes some practice to develop sensitivity, but the energy is moving whether you feel it or not. If you’ve developed some sensitivity already, then a few minutes of this meditation should leave you feeling energised, possibly with a buzzing or tingling sensation in your body, and especially in the palms of your hands. Once you have finished the meditation, state your intention for what you want the orgonite to help you with. While doing so, get your emotions involved and feel it real. Imagine what it would feel like if the intention was achieved. Now that you have connected your energy with the orgonite, you are giving it instructions for how you specifically want it to balance your energy, so be as clear as you can. You can do this meditation as often as you wish! Some choose to do it every day, some only do it once when they first start using the orgonite. Even if you choose not to do the meditation more than once it can be helpful to re-affirm your intention often while in contact with the orgonite. Happy orgonising! 🙂 And if you have any other ways you like to connect with orgonite (or crystals), be sure to leave a comment below!